Articles on safety, riding, training and horse ownership. Here you will find many friendly, supportive, knowledgeable equestrians. If you have a question you can usually get a good answer here. I try to answer questions that I can answer well, but there are other trainers and instructors who also offer very good advice. Heather Moffett offers a down-to-earth approach to riding and training, "Riding in Harmony with your Horse." Her website has information about her clinics, products, articles, and a forum. Also, Heather Moffett will sometimes offer advice and comments on the NewRider forum. She has a brief section on the NewRider site: A Kinder Way to Ride. Heather's book is Enlightened Equitation: Riding in true harmony with your horse. 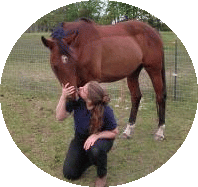 Jessica Jahiel offers wise and practical advice on just about any aspect of horses (care, riding, training). She has a searchable archive, and an advice mailing list. You can submit questions that she may answer in her weekly mailings. Horse Behavior Problem-Solver: Your Questions Answered. Marv Walker's style of handling and training resonates with my experience, more than any other trainer out there. Kellie is a dear friend of mine, and a dedicated and talented saddle fitter. She works out of Georgia, and also holds clinics across the US. She can often be found working with Marv Walker (see above) and her husband Bob Sharpe, an Equine Sports Massage Therapist. If you're in Kellie's area, or she's coming to your area, I highly recommend consulting with her. Emergency! : The Active Horseman's Book of Emergency Care by Karen E. N. Hayes. Terrific, detailed instructions for dealing with emergencies--and written in a step-by-step format that would be easy to follow when panicking. (Would I panic when my horse is colicking? You betcha.) I borrowed it from my local public library to look over, and I ordered it for myself online before I had returned it to the library! Excellent book. EVERY TIME. . . EVERY RIDE. . . is an educational video on head injury prevention is a must for all riders, instructors, horse clubs and parents of children who ride. Narrated by William Shatner, this professionally produced, approximately 20 minute, educational video demonstrates the need for SEI* protective headgear. Interviews blended together with excellent footage of horses in a wide variety of sports show the benefits of wearing the proper helmet--as well as the unfortunate consequences of riding without one. Experience, training and the quietest horse in the world are no guarantee of safety. It's the height that puts the rider at risk -- sometimes fatal risk. A rider's unprotected head can receive over 1000 G's of force in ANY fall, at ANY speed -- simply because the fall begins from on top of a horse or pony. Today's energy absorbing, SEI* certified helmets can reduce this force to minimize or prevent injury. For more information, see the WSU 4H site. To purchase, see the WSU 4H "Merchandise" page. Mark Rashid has a number of books about horse training and problem solving. He writes in an easygoing style which is easily read, yet still informative. His books have been some of my favorites since the first chapter that I read. Mark's writing is wonderful and clear, and he has so many things to say. The prolific author Cherry Hill offers advice on lots of topics, and also has a newsletter in which she answers readers' questions. Viv has compiled a list of articles helpful to the rider, particularly the adult beginner. Her pages explain topics under these headings: "The Horse; The Rider; The Gear; The Sports; The Books; The Links; The Articles." It looks like the site is designed to be clear and informative whether you are a beginner (unfamiliar with the "jargon" and inexperienced with horses) or looking to brush up on a particular topic. Chloe has collected a nicely comprehensive list of treeless and bitless links, as well as a section on natural horsemanship/handling links. Proper nutrition and feeding practices can have a huge impact on the health and well-being of a horse. Building a feeding program based on the digestive physiology of the horse, along with meeting the horseâ€™s nutrient requirements as determined through scientific research will bring out the best in a horse and improve a horse'€™s quality of life. Vineyard Nutrition is dedicated to providing professional equine nutrition consultation services to clients in North Central Florida and remotely over the internet. Please explore the site to learn more about Kelly Vineyard and the services offered by Vineyard Nutrition. Es has a great page on how showing works: what to do, what to wear, and tack and turnout for your horse. "The Riding School" on this site offers a series of articles describing some rider, and some horse, riding movements. With clear descriptions and good graphical supports this site offers some nice tips. "Our program emphasizes evaluation of the entire horse to identify, understand and treat the root cause of a muscular problem; not just the most obvious symptom. When evaluating a horse, our students are taught to consider the horse's skeletal conformation, specific discipline and cross-training programs, the tack and the rider. Each of these elements has an effect on the horse's movement and well-being." Saddle Up Tack and Supplies provides a high-quality selection and service at reasonable prices. Susan is knowledgeable about her products and she is always ready with suggestions. She's pointed me to a few very effective items, some of which I've never seen anywhere else.